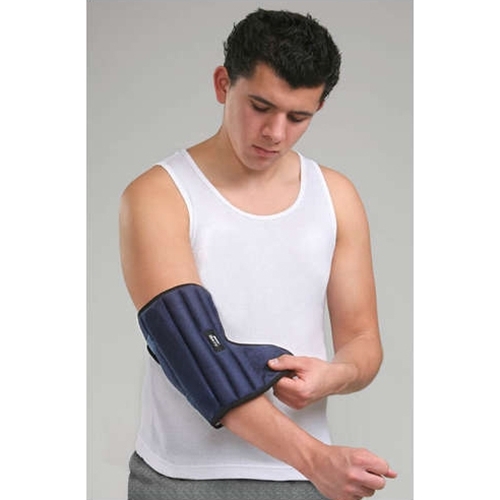 IMAK Elbow PM from HealthyKin.com offers exceptional comfort while gently immobilizing your elbow, preventing painful movements while you sleep. 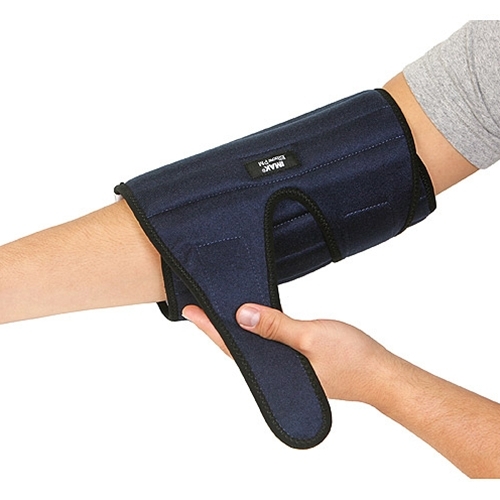 It is a leading brace for nighttime relief of cubital tunnel syndrome, or pain relating to pressure on the ulnar nerve. The soft fabric and breathable foam keeps your arm comfortably warm, and the cotton lining allows skin to breathe. IMAK's Elbow PM features a removable splint and dual Velcro® closure for customizable compression and support. Use IMAK's Elbow PM for nighttime relief from cubital tunnel syndrome pain, tennis elbow, golfer's elbow and other elbow pain. I had been searching for a few months for this nighttime elbow sleeve to help keep my right arm straight while sleeping & minimize effects of cubital tunnel syndrome. I was pleased with the listed price so I ordered it. It arrived very quickly & I have been using it mostly at night as intended. No complaints about this supplier; they handled everything to my satisfaction. As far as the product itself, I don't find it is stiff enough to prevent my elbow from bending with the plastic splint in the top-of-arm position as the manufacturer instructs. I find if I rotate the sleeve so the splint is positioned over the inner bend of my elbow instead it is more rigid & prevents too much bending. I ordered the night elbow sleeve to keep my left arm straight. It works, however, the company should offer a smaller size as I had to have the inside holder taken in as much as I could. Using the sleeve at night eliminated the numbness and pain that I was experiencing in my left arm due to too much snow shoveling. My only complaint is that the splint has a tendency to migrate out of the sleeve during the night. A small velcro closure to hold the splint in place would be helpful. Even so, the sleeve still keeps my arm straight enough without the splint to get a good night's sleep. This product DOES do what it is supposed to do. However, I'm not a doctor and I do not know how to put it on properly. The pictures along with the captions on the box explaining how to put it on ARE NOT AT ALL HELPFUL ENOUGH. Therefore, I'm sure this sleeve does do what it is supposed to do, but I have not found out yet because I don't know if I'm wearing it correctly. Dealing with cubital tunnel syndrome requires me to keep my arm straight while sleeping so that I don't wake up with a completely numb. The arm / hand specialist was going to provide me the same type of splint for the small cost of $140.00. This product is easy to put on, adjustable, and washable. It is hard to get it tight enough on my arm by myself. They way it says you are supposed to put it on does not work for me. I am using it because I didn't want to pay to send it back. I would not buy another one. The brace arrived quicker than expected. Am wearing it each night as recommended by my MD, however, frequently have to remove after 5-7 hours as my arm starts to feel very uncomfortable. It overall does seem to be helpful in reducing the ulnar nerve symptoms that I have been having.